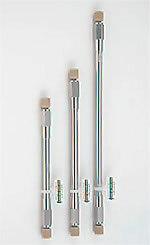 The Shim-pack XR-ODS, which was developed with the aim of increasing the speed attained under standard column pressure conditions, has been joined by the Shim-pack XR-ODS II, which was developed in order to facilitate high-speed, high-separation analysis for a wider range of applications, such as those involving methanol mobile phases, by using a new long column. The Shim-pack XR-ODS II is a high-separation analysis column that is suited to use in combination with the Nexera XR and that can also be used for high-temperature analysis. Reducing the particle size of the packing material to an optimum level and unifying the particle diameter help suppress flow resistance and ensure excellent stability. As with the Shim-pack XR-ODS, quality control is performed in accordance with the standards indicated in the quality assurance document provided with the column. The results obtained by performing the high-separation analysis of polycyclic aromatics using the Nexera XR and the XR-ODS II are shown below. With general-purpose LC, the resolution, RS, for isomers of benzofluoranthene was 1.25, whereas with the Nexera XR, this was significantly increased to 2.12. With general-purpose LC, the analysis time was approximately 50 minutes, whereas with the Nexera XR, it was reduced to approximately half this. One advantage of increased speed is reduced consumption of mobile phase. The Nexera XR (pressure resistance: 66 MPa) also helps expand the range of analysis methods that can be used by, for example, allowing the use of water/methanol mobile phases and long columns, and enabling analysis to be performed at room temperature. The results obtained by analyzing the catechins in green tea using a water/acetonitrile mobile phase and a water/methanol mobile phase are shown below. It can be seen that the separation selectivity, as represented by the elution order and the separation between components, differs between the methanol and acetonitrile systems. This example illustrates how the Nexera XR helps increase the range of available analysis methods, a feature that is useful for method development.